“The only downside is that there’s less excuse for not giving it a try,” newsletter Editor Steven Rosenbush writes. FAIR “evolves the conversation at the board level around those metrics and gets it away from the technical security jargon sort of discussion, and again around whether we’re effectively managing risk with that metric or not,” Young says. The Journal also gave a nod to The FAIR Institute, quoting Memberships and Programs Director Luke Bader that membership has grown to nearly 4,000 since its founding in 2016 and FAIR use among Fortune 100 companies has hit an estimated 30%. 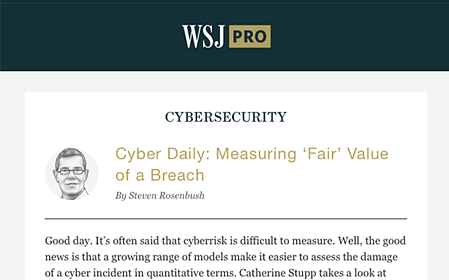 Read The Journal article: Charles Schwab Looks to Risk-Based Model to Quantify Costs of Cyber Incidents (subscription required).